Jersey Porridge Day 2017 is on Tuesday the 10th of October. It is run once a year in support of Mary's Meals. Jersey Porridge Day 2017 is on Tuesday the 10th of October. 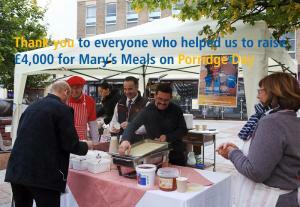 Jersey Porridge Day supports Mary's Meals, a charity feeding the World's hungriest children. The Rotary Club of Jersey are pleased to announce that World Porridge Day will be held on Tuesday 10th October 2017 to raise funds for Mary’s Meals. Porridge Day will be launched by preparing a porridge breakfast for primary schoolchildren from six of the islands schools on the 3rd October with World Porridge Day itself following a week later. By providing a daily meal in a place of learning, they meet the immediate needs of hungry children and encourage them to go to school to gain an education that can, in the future, be their ladder out of poverty. These life-changing meals attract hungry children into the classroom. The food fills their empty stomachs so they have the energy and opportunity to learn, giving them the chance of a brighter future. The meals also support families struggling to feed their children while boosting the country’s wider economy. 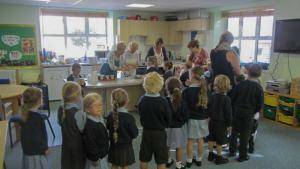 The school feeding programmes are owned and run by community volunteers in the countries where they provide food. For example, there are over 65,000 volunteers in Malawi who take turns to prepare, cook and serve the daily meal in each school. School feeding committees – made up of parents, teachers and volunteers – are crucial to the work and one of the first things to be established in any new area receiving Mary’s Meals. Monitors from Mary’s Meals work closely with these committees. They regularly visit schools to ensure the precious ingredients we provide are cooked and served correctly and to offer training and encouragement to the community volunteers. Wherever possible, locally produced food is served. This supports the local community and its farmers as well as the wider economy. On Tuesday 10th October Porridge Stations will be at the Pomme D’Or, West Centre, Charing Cross, Brooke Street, the Esplanade and Cyril Le Marquand House. Delicious porridge will be available with a variety of toppings for a donation to Mary’s Meals. This is the sixth year Rotary has organised this event. World Porridge Day has become a very popular event, raising thousands of pounds annually for the world’s poorest and hungriest children. 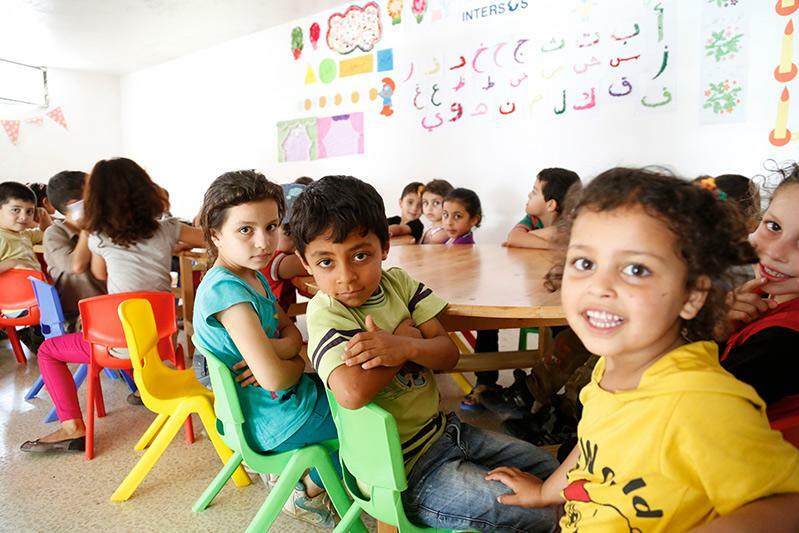 Mary's Meals are now helping Syrian children who have sought refuge in Lebanon. Like all of us here at Mary’s Meals, I’m sure you feel deep compassion – perhaps even outrage – at the desperate plight of refugees forced to flee from war-torn Syria. In fact, this awful war has contributed to a recent increase in the number of children out of school globally, from 57 to 59 million. Forced to escape the bloodshed and horror in their homeland, millions of Syrian children are now out of school in the places they have sought refuge. I am pleased to share with you that, thanks to support from the players of the People’s Postcode Lottery, we are planning to soon begin serving Mary’s Meals to a small number of Syrian refugee children in Lebanon. In 2015 the Final Total raised was £5,400 which was doubled up by UK Aid to £10,800, thank you all for your help to reach this magnificant sum. Here is a thank you letter from Magnus Macfarlane-Barrow the CEO of Mary's Meals. I want to thank you from the bottom of my heart for contributing £5,400.00 to the Mary’s Meals Feed Our Future appeal and allowing your donation to be matched by the UK Government. This opportunity to double our UK donations has come at a time when Mary’s Meals is needed more than ever, and your generosity will allow us to reach more children in need of daily sustenance and hope for the future. In order to receive match funding from the UK Government to double your donation, allowing us to have twice the impact in the communities where we work, we need you to complete and return the enclosed Group Consent Form, to confirm the funds are eligible to be doubled. I really appreciate you taking the time to do this. Please return the enclosed form to our team: Mary’s Meals, FREEPOST NATN 448, Dalmally, PA33 1BR. Children such as eight-year-old Wilson, whose family lives near Mchenga Primary School in Chikwawa, Malawi. They’re struggling to survive while food is scarce, work is difficult to find, and acres of fertile land have been left ruined by recent floods. The family of ten escaped their home before it was washed away by the flood waters. With nothing but the clothes on their backs, they clinged to one another all night in the torrential downpour, waiting to be rescued. George’s family was rescued and brought to nearby Mchenga Primary School, along with more than seven hundred and twenty-five displaced families. 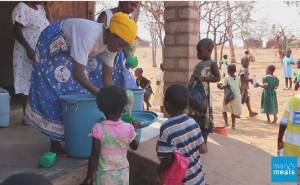 For three months, Mary’s Meals provided basic hygiene items as well as serving porridge, twice a day, to the school children and displaced families. Like many others from the same area, George and his family have been unable to return to their village, since their home has been reduced to a heap of mud and dried grass. They’ve moved closer to the school, to be on higher ground and to make it easier for Wilson to attend daily. The food crisis in Malawi continues, but George holds on to a glimmer of hope for the future: “There’s no food, but at least my Wilson is in school eating porridge daily. During moments of despair, I think of this and it makes me smile. If Mary’s Meals continues to feed children at school so they can grow to be an intelligent generation of Malawi, then all is not at lost”, he said, hugging his son. Thank you for enabling us to bring food, joy, and hope to communities when they need it most. And thank you for helping us to raise the necessary funds to do so twice as quickly, while we are benefiting from the UK Government’s Aid Match scheme. That is the message from their founder Magnus MacFarlane Barrow. 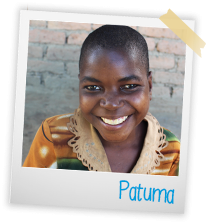 Patuma a 13 year old orphan who attends Chirimba Primary School, Machinga Malawi was the millionth child. In fact the news gets even better, Magnus tells us that 1,035,637 children, like Patuma, are now eating Mary’s Meals every school day in some of the world’s poorest countries. More than anything, it makes Magnus feel even more strongly that this vision of Mary’s Meals – that every child receives a daily meal in school - is possible. As Magnus says their work has only just begun. Do help us again in October 2015 to raise even more funds for this truly worthy cause. Here is a video of a celebration party in Malawi where Mary’s Meals first began feeding 200 hungry children in 2002. Enjoy. 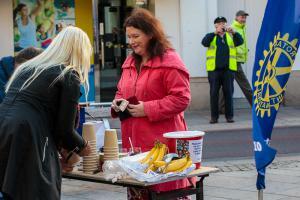 The Jersey Porridge Day Facebook page gives regular updates on Mary's Meals activities. Follow us there and get regular updates on the 2015 event. One of the latest videos from Mary's Meals, "Shazia's Story", sets the scene for all the work they do. Watch it here. Also read here how Mary's Meals are coping in the midst of the Ebola Outbreak in Liberia. 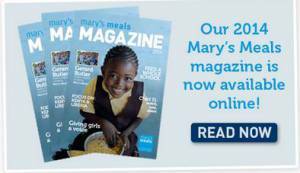 For more information on Mary's Meals. If you would like to help us with Jersey Porridge Day or have any questions do email us. 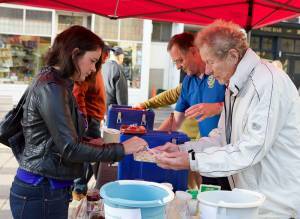 For a full run down on Jersey Porridge Day 2013 see here. A celebration of joy and happiness at Mary's Meals largest feeding programme in Malawi. The Story of how 10 years old Grace was saved! 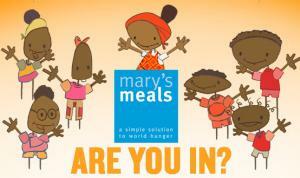 An animation showing what Mary's Meals can do to help hungry children the world over. How Mary's Meals developed to what it is today.